In order to diagnose osteoporosis, a doctor needs to perform a full evaluation of your health and medical history. In general, that includes performing a bone mineral density scan, or a BMD scan. These tests can sound daunting to those who have never experienced one before, but they are actually simple, fast, and completely painless. Learn more about bone density tests and what they entail. A bone density scan works very similarly to an x-ray. In fact, this type of test even uses x-rays, although they are low-level x-rays and emit much less radiation than a normal x-ray. This makes them even safer than regular x-rays and other bone scans. There are two main types of bone mineral density scans: a central scan and a periphery scan. It is used to investigate large bones in the body, like the spine. You will lie down on a soft table surrounded by medical equipment. This machine is typically called a DEXA, which stands for “dual-energy x-ray absorptiometry”. With a central DEXA, part of the machine will move over your spine, hips, and legs while you lie still. It is for smaller bones, like hands and wrists. These machines are portable, so you may not even need to make a visit to a special medical center. With this machine, you simply have to place an extremity - such as a hand or foot - into the indicated spot and the machine will scan for your bone density. 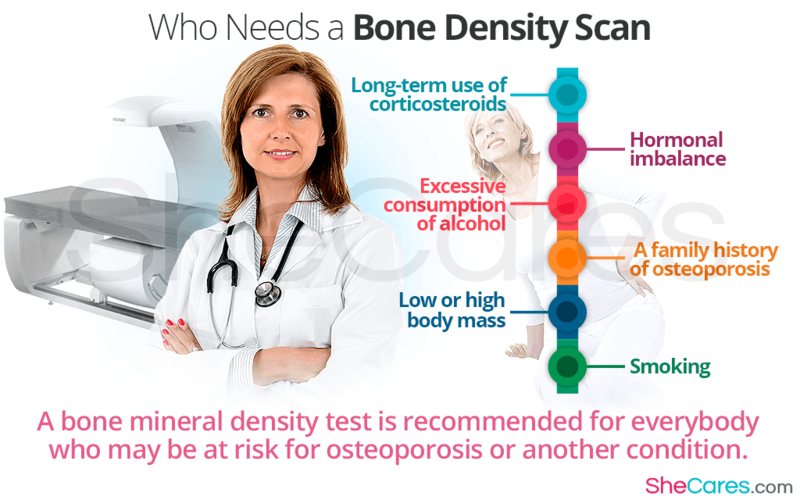 A bone mineral density test is recommended for everybody who may be at risk for osteoporosis or another condition causing weakened bones and a loss of bone density. Scans are often performed as a preventative measure, to ensure that bones do not lose density to the point that they become too weak and fracture. In general, older adults are at a higher risk of developing osteoporosis, so women over age 65 should be regularly tested using a bone density scan. However, other risk factors can also increase chances of osteoporosis, so anybody fitting the following conditions should also talk to a doctor about testing bone density. Long-term use of corticosteroids or other medications that may damage bone health. Hormonal imbalance, such as those associated with menopause. The scan will provide your doctor with results called a T-score and a Z-score. The T-score compares your bone density with the bone density of a healthy young woman, and a Z-score compares your bone density with the average bone density of a woman your age. A negative score means lower bone density, so it is better to have a score closer to zero. A T-score between -1.0 to 1.0 means that you have normal bone density. Anything between -1.0 and -2.5 indicates some amount of bone loss, but not necessarily a diagnosis of osteoporosis. However, a score below -2.5 is an indication of osteoporosis.